One of my goals for 2017 was to knit socks, as many as I have time for. 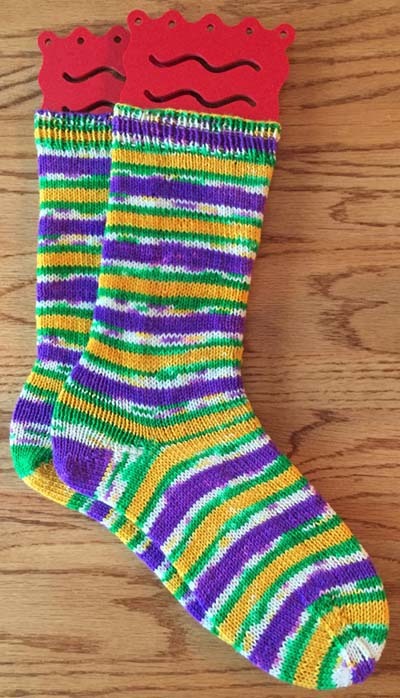 I've got lots of sock yarn that I like, and I wear my handmade socks often. I ended January with two pairs. Here's the lastest pair. Pattern: Generic. Cast on 60 sts., K1, P1 Rib for 12 rounds, Stocking Stitch leg for 75 rounds, Short row heel, Stocking Stitch foot for 50 rounds, Shaped toe. Note: Abi's yarns are colorful and fun to knit with. I've already made socks with her Watermelon and I have Kiwi on the needles. 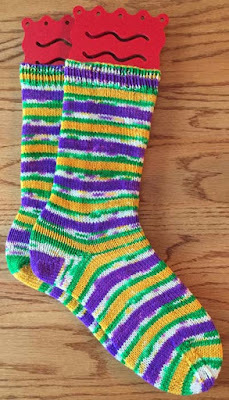 I love these Mardi Gras colors. Here's my Ravelry link. Laissez les bon temps rouler - Let the good times roll. Bright and pretty, just right for the middle of winter.